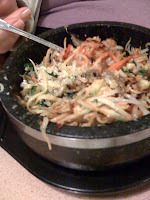 People always ask me, "Where do you go for Korean food in Columbus? 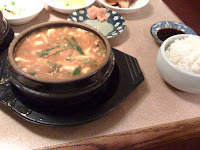 "and while there are many good places, the family favorite is Kikyo. Located in the Golden Bear plaza, right next to the Upper Arlington post office on Riverside drive. Despite the Japanese name, Kikyo is owned by my friend DeeDee who makes everything with love and from her garden when possible. While the menu is a mix of Japanese and Korean, everything is done with a true eye for detail. 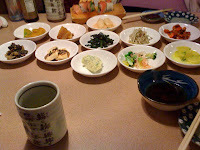 Mom and I usually go for the dolstbibimbop (rice, veggies and meat in a hot stone bowl) or the kalbi (marinated beef short ribs) I will sometimes join my father in ordering from the Japanese side of the menu with such items as tempura udon, or nabiyaki udon. 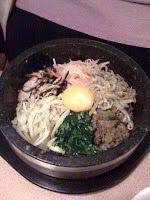 Mom's favorite is the dolstbibimbop, hot rice topped with various vegetables, bulgogi and a raw egg, which gets cooked from the fact that the whole thing is served in a BLAZING hot stone bowl. Add some spicy fermented bean paste sauce, mix it all up and it's a hearty meal to keep you warm inside. On this trip I got a tempura appetizer and something I usually don't, soondobu. 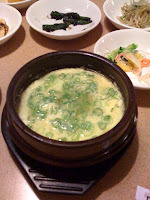 A spicy seafood soup served bubbling hot with gobs of soft tofu soaking up all the yummyness of the soup. 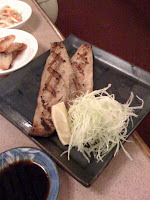 We also got an order of grilled Korean mackerel, and a Kikyo roll. Raw tuna with avocado and a spicy mayo sauce. Top everything off with a scoop of green tea ice cream with sweet adzuki beans and you've got one hearty meal! Kikyo is open Tuesday-Sunday 4 pm to 12 am (yes, that's right!) and is located at the corner of Riverside drive (Rt 33) and Fishinger road.